Whitley made it three wins in a row as Nathan Haslam continued his unbeaten start as Bay manager and this was by far the most impressive victory of them all. Second top Consett played their part in a thoroughly entertaining game especially in the first half but after the interval, Whitley took control and but for a series of top class saves from former Bay keeper Kyle Hayes, the margin of victory would have been much greater. Whitley attacked straight from the kick off and might have taken the lead after just 16 seconds when Luke Salmon had his shot blocked by Hayes. The visitors then created an opportunity of their own in the fifth minute but Richard Juul blazed his shot out of the ground when well placed. Four minutes later, Consett had another chance but this time, skipper Daniel Craggs slotted the ball the wrong side of the post. 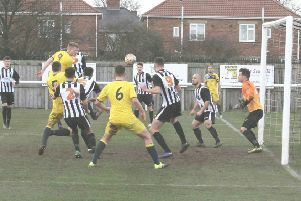 The action continued at a rapid pace and in the 12th minute some in the crowd thought Whitley had taken the lead but Olly Martin’s well struck shot was pushed just round the post by Hayes. Whitley took a deserved lead in the 32nd minute when Salmon’s cross from the left eluded the Consett defence and from 15 yards, Andrei Andrelean finished with aplomb. Stephen Ramsey almost doubled the lead in the 39th minute with a powerful shot from the right but Hayes somehow got his fingertips to the ball. Two minutes later at the other end, Dan Lister made a tremendous point blank save to keep out a volley from Craggs, a crucial save that saw Whitley retain their one goal advantage at the break. On the restart, Craig McFarlane was denied by an astonishing save from Hayes, who pushed his stinging close range shot onto the bar. Whitley were doing most of the attacking and they created another chance in the 58th minute when Walton’s cross was allowed to bounce across the 18 yard box and Salmon got his head to the ball but could not direct it on target. Midway through the half, Hayes once more came to his side’s rescue, pushing a dipping shot from Walton just over the bar. Olly Martin took the left wing corner and floated it to the edge of the six yard box where Salmon leapt to send a glancing header past a helpless Hayes into the far corner of the net.